On Friday 28th September 2018, Godfrey Okoye University went on the GO again. The NUC affirmed fastest growing university in South Eastern Nigeria, took another unprecedented step into improving functional education in Nigeria. 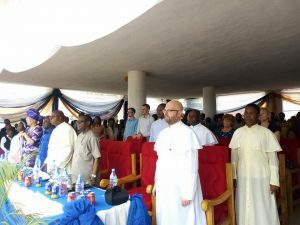 It was an all embracing gathering at the Justice Cordelia Chukwurah Arena. 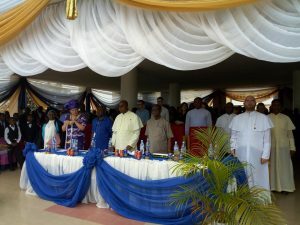 First, Godfrey Okoye University secondary school (the breeding ground for excellence) inducted new students into the school. The new 2018/2019 academic session has One hundred and Sixty-Two (162) new students joined the GO EXPERIENCE out of the very many wishful applicants who sat for the entrance test. The director of Godfrey Okoye University and group of institutions, Rev. Fr. Prof. Christian Anieke, while inducting the new students encouraged them to consider themselves privileged to join the GO train. 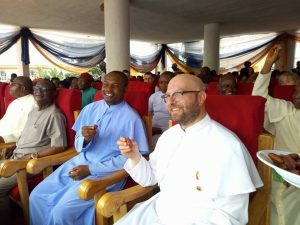 He reiterated that the school’s watchword is “Excellence”; and challenged the students (old and new) to awaken their receptive spirits and strive to make a difference among others. 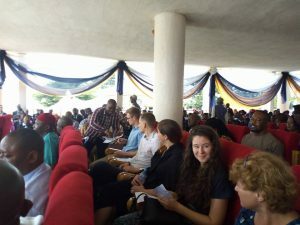 The second phase of the day’s event marked the inauguration of the Student Training for Entrepreneurial Promotion (STEP) project in Godfrey Okoye University, Enugu. In a bid to cut down the overdependence on the government by Nigerian graduates, the STEP project came as a game changer. With the maxim: empowering people to empower others. Founded in 2006 at the University of Lüneburg, Germany, the project is an initiative which helps students explore various economic possibilities, their inner creative potentials and making independent livelihood. The project is designed to extensively train a selected number of students in institutions of higher learning, and financially empower them (amidst supervisions and follow-ups) to start up their respective choice of businesses in hope that they will successfully develop into being independent, responsible and law abiding citizens. The Project nonetheless is hoped to grow the nation’s economy and by extension create more jobs in the society. 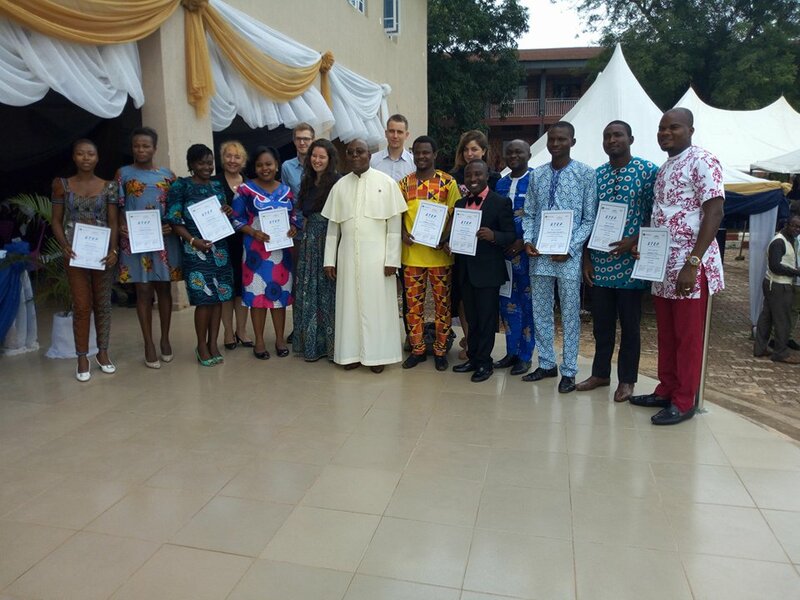 The STEP project took its first step in Nigeria to Godfrey Okoye University, Enugu. The STEP Project Coordinator Elisabeth Erning who was present at the arena with her team of Instructors from the Leuphana University of Lüneburg, Germany to introduce the project, emphasized that the motive of the project in Africa is to help schools produce graduate who would be self-dependent and job creators rather than resort to cybercrimes and other social vices as alternatives to unemployment. She announced also that the STEP project has been recently launched in Uganda some years ago and has proven successfully. Erning furthermore expressed anticipation that such will be exhibited here in Nigeria through Godfrey Okoye University, Enugu. By analogy, she enjoined GOUni to zealously breed the STEP chick being handed to her and watch her lay the golden eggs as it has done in other beneficial countries. In his joyous response, the Vice Chancellor of GOUni Rev. Fr. Prof. Christian Anieke thanked the STEP team and assured them of a fruitful breeding of the project. He however sited that his research has shown that STEP has made Millionaires of young graduates in about three (3) countries where is has been launched; and such reflections are some of the expectations GOUni hopes to pioneer in Nigeria. He further made it clear that, being the breeding ground for STEP in Nigeria, GOUni will surely explore it to the fullest and then export its yoke to other schools in the country, beginning with our affiliate schools.